This spring in Paris has seen a great profusion of white asparagus. It came onto the market in early March, ahead of the green variety, and at prices so tempting I couldn’t resist. This, plus a request from a Japanese cooking student, has sparked my creativity this season. I have served white asparagus many times, with a wide variety of sauces. For the delicate flavor of this versatile vegetable can be complemented in many ways. Opinions differ on white asparagus, but the French generally consider it a greater delicacy than the green variety. Its white color stems from the fact that it is grown underground. It is generally available only during the spring. In terms of preparation, the main difference between white and green asparagus is that the white spears must be peeled. This is not a major conundrum, however. A light touch with a vegetable peeler will do the trick. And now to the sauces. The asparagus shown in the photo above is adorned with a sauce of crème fraîche, lemon juice, salt, pepper and chives that I invented in my kitchen (well, perhaps someone thought of this before, but I’ve never seen a recipe). It is light and fresh, and marries well with the asparagus without overwhelming it. Another sauce I invented combines sesame oil, lemon juice and salt. It is shown here on asparagus spears that have been cut into segments and piled up for an elegant starter. The asparagus is sprinkled with toasted sesame seeds, drizzled with the sauce and topped with fronds of fresh cilantro. Moving on, some restaurant news. Le Monde ran a big article this week on the revival in Paris of old-fashioned bistros — places that serve old-fashioned dishes like blanquette de veau, oeufs durs mayonnaise and … white asparagus, and where red-and-white checked tablecloths, bread baskets and pyrex glassware hark back to an earlier era. The author attributes the trend to a quest in our complex era for l’authentique (the authentic), which he goes on to rename le fauxthentique, (a play on the word ‘false’), for of course we can never recapture the true nature of what used to be. One restaurant highlighted in the article is Aux Bons Crus, a bistro located near the town hall of the 11th arrondissement. I dined there recently with a friend and would have to say the false comes through more strongly than the true. The place has all the touches of an old-fashioned bistro — chalkboard menus, retro decor, etc. — but the food did not live up to the reputation, or my memories, of classic French cooking in days gone by. What the article did not mention is another trend in Paris, of young chefs putting a modern spin on classic dishes. The latest such establishment to open is JJ, a very contemporary bistro located, I am extremely happy to say, right downstairs from my apartment. It is run by two friends — John, the British-born chef, and Jérémie, who takes care of the front of the house — and the cooking is absolutely inspired. For example, at a private opening last weekend, they offfered a delicate, creamy carrot soup with cockles and herbs (to die for), foie gras with hazelnuts and a foamy morel appetizer served in a small cup. A Russian friend was coming over for a cooking lesson. He wanted to learn to make easy dishes he could prepare ahead of time to serve when friends came for supper at his dacha. Top of his list was … beef stroganoff. 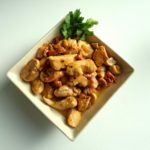 I found the idea of teaching beef stroganoff to a Russian to be rather fanciful, so I suggested poulet bonne femme, an earthy dish of chicken, bacon, mushrooms and onion that, like stroganoff, is finished with cream. Reader, he liked it. And found it surprisingly simple to make. We chopped for about five minutes, then got things going on the stove. While the chicken was cooking, we made some rice. Within half an hour, the food was ready to bring to the table. 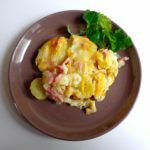 To date, there is only one other bonne femme recipe on this site: omelette bonne femme, an omelet with bacon and potatoes. But bonne femme dishes abound in France, from filets de sole bonne femme (sole in a mushroom cream sauce) to lapin bonne femme (rabbit stewed with mushrooms and bacon) and even laitue bonne femme (hearts of Boston lettuce cooked with bacon and onion). Now that’s country cooking. My Russian friend went home to his dacha, and I haven’t yet heard whether he’s attempted making poulet bonne femme for his friends. But I’m sure he will one day. And when you’re in the mood for a simple, tasty supper, why not give it a try? The other day a friend brought me a humble present — a jar of anchovies. But not just any anchovies. They were from Collioure, a picturesque fishing port on the French Mediterranean coast, which by some accounts produces the best anchovies in the world. 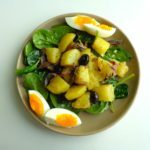 I decided to try them out in a tangy salad of potatoes and black olives, set on a bed of baby spinach leaves, with mellow eggs on the side. The combination proved to be a knock-out. Collioure, a small town just north of the Spanish border, is a popular tourist destination. It is perhaps best known today for the artists who flocked there a century ago, among them Matisse, Braque, Picasso and Dali, drawn by the light. But well before the artists came, the town was known for its anchovies: the tiny fish, found in abundance off the coast, have been netted and salted by local fishermen since the Middle Ages. When I looked into the use of anchovies in Collioure’s cuisine, I found only a single recipe: an apéritif plate of anchovies, roasted red peppers, olives and hard boiled eggs, sprinkled with garlic, parsley and olive oil. That sounded pretty good — but it felt like a dish for summer, and we’re only just entering spring. So I decided to improvise. Anchovies marry supremely well with potatoes, which soften the salty tang. In this salad, the potatoes are bathed in a sauce of lemon juice, olive oil and crushed coriander. 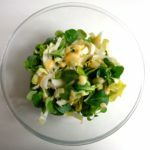 Anchovies and olives are added to the mixture, and the baby spinach leaves are coated with lemon, olive oil and garlic. Served with crusty bread and a glass of rosé, it will have you dreaming of summer — a fine way to spring into spring. Are French fries the ultimate French food? They may have been, but their quality in bistros has declined so much over the years that their enduring popularity here in France is a mystery. I would walk across Paris for good frites — crispy on the outside, meltingly tender on the inside — but they are not so easily found. There is another solution. Making your own fries is remarkably simple, and they are just as good as the delectable original. If you’re new to French frying, aka deep frying, you may be put off by the idea of cooking in very hot oil. Don’t be. You need no special equipment to make French fries, just a sturdy pot, a strainer and paper towels. You chop the potatoes to the desired shape, rinse them and fry them — twice. The double frying is the secret to success. And yes, that’s how restaurants do it. The problem with restaurant fries is that laziness has set in. Instead of using fresh potatoes, many chefs now stoop to frying up pre-cut frozen potatoes that often — horrors! — have been coated in flour. The result is a soggy, tasteless mess. And although decent frozen fries that can be baked in the oven are available for the home chef, they bear no comparison to the real thing. But just how French are French fries? This is a matter of hot dispute on opposite sides of the French-Belgian border. The Belgians claim that pommes de terre frites are part of their national cultural heritage. 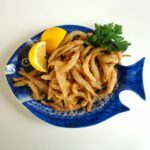 The story goes that, a couple centuries back, Belgian fishermen would deep-fry tiny fish they caught in the Meuse river, and when the river iced over in winter they would substitute potatoes cut into the shape of the tiny fish. The French scoff at this version of events, maintaining that frites first emerged in Paris and were sold on the streets in 1789 during the French Revolution. Thomas Jefferson, who was ambassador to France around the time of the revolution, reputedly loved frites and brought the recipe back to the States. They were also a hit with American GIs who came over to Europe during World War I and popularized French fried potatoes across the country when they came home. Frites crossed the Channel around the mid-19th century, becoming part of the beloved British duo fish and chips. Frites (pronounced FREET, rhymes with ‘feet’) are so identified with France that, in the infamous episode of 2003, American congressmen angry at the French refusal to invade Iraq renamed them ‘freedom fries’. They could have simply taken them off the menu — but in fact they never stopped eating them. The French like frites so much that sometimes they will buy an overflowing paper cone of them as a snack. The first time I encountered this, while visiting friends in the Dordogne in the ’70s, I couldn’t believe my luck. Straight out of the fryer, crisp and salty, they were sinfully delicious. And for years, the frites served in restaurants were nearly as good. That time having passed, why not try making them at home? French fries marry well with many dishes on this site, among them all the omelets, mussels in white wine, petite friture (small fried fish), roast chicken, lamb chops and all the steaks. They are not just vegetarian — they are vegan. So whatever kind of foodie you are, buy a bottle of cooking oil and some good potatoes, roll up your sleeves and set to work. Simple starters are having a moment in Paris, and today I am featuring one of my favorites, cucumbers in cream. This tasty dish may be enhanced with the herb of your choice – cilantro, dill, chives or chervil – and served on its own, with another simple starter or two, as part of an assiette de crudités (mixed veggie plate) or alongside smoked salmon. And best of all for the everyday chef, it takes no more than five minutes to prepare. The trend toward simple starters began at Paris bistros a couple years back with the revival of another classic, oeufs durs mayonnaise (hard-boiled eggs cut in half and bathed in sumptuous homemade mayo). It gets star billing at Le Desnoyez, a terrific bistro in the Belleville district, and many other establishments with young, innovative chefs. This is good news. Once a menu standard, the dish had fallen in stature to the point of becoming inedible, with cafes serving up overcooked, rubbery eggs with commercial mayo squeezed out of a bottle. No respectable restaurant would serve it this way. But now it’s back. Another popular simple starter is avocado toast, a relatively recent arrival in Paris. A bistro down the street from me, Café Pola, serves it in the form of avocado and horseradish purée on toasted country bread garnished with slice radishes and cucumber ribbons, with or without smoked salmon alongside. Pola recently scratched oeuf dur mayonnaise from its menu in favor of a warm poached egg, but plans to restore it when summer arrives. While we’re on the subject of starters, I’d like to mention the fact that they are known in France as entrées, which is confusing for Americans since ‘entrées’ in the States are main dishes. The French version is the accurate one, since entrée translates as ‘entry’, as in entry to the meal. How did this confusion arise? My understanding is that, back in the old days when elaborate meals featured many courses, the entrée was generally a warm dish, like a soufflé, that followed a soup or a cold hors d’oeuvre, for example radishes with butter or pâté, and preceded the main dish (plat principal). Over time, as menus simplified, hors d’oeuvre and entrée got conflated to mean any starter. Returning to concombres à la crème, preparation involves simply peeling and slicing the cucumber, adding cream, salt, pepper, herbs and perhaps a dash of lemon juice. 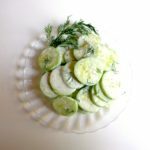 It is best prepared just before eating so that the cucumbers remain crisp. 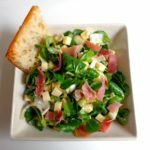 If you’d like to serve the dish with another simple starter, I can recommended grated carrots with lemon and olive oil, beet salad with walnuts, sliced hard sausage (saucisson sec) or cured ham, smoked trout or salmon, herbal tomato salad, warm lentil salad or … oeufs durs mayonnaise. When the French are asked to name their favorite dishes, couscous invariably comes near the top of the list. And why not? This import from North Africa is delicious, economical and healthy. The fluffy semolina grain forms a bed for veggies and chick peas cooked in a rich broth flavored with mildly exotic spices. Then along comes your choice of meat, poultry, spicy sausage, fish or a combination, as in this ‘royal’ version. If you’ve never encountered couscous, or even if you have, it’s important to note that the word has a dual function: ‘couscous’ the grain and ‘couscous’ the dish. I have prepared couscous the grain thousands of times to use as a side dish for meat, fish or game, or as a breakfast cereal with butter, sugar and cinnamon, but have relatively rarely made couscous the dish, which is readily available in restaurants here and is a bit of a production to prepare at home. Nonetheless, home cooking allows you to be creative in your choice of ingredients and to spice the broth as you desire. The ‘royal couscous’ featured here, with a mixture of meats, is a French take on the original, which became a fixture of the French culinary repertoire after the country’s North African colonies gained independence in the mid-20th century. There are many regional variations. In Algeria, the broth may be made without tomatoes (clear) or with (red), while in Morocco and Tunisia it is typically red. Morocco uses spices such as saffron, ginger and cinnamon to impart a subtle flavor, while fish couscous is popular in Tunisia and Algerians often add broad beans. Beyond these generalities, every community has its own speciality, and sweet couscous with almonds or raisins is a popular dessert across North Africa. 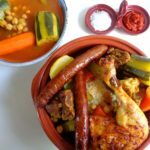 According to Wikipedia, the French had tasted couscous by the 16th century — Rabelais mentions it his novel Pantagruel — and the dish gained ground in southern France during World War I when Algerian workers were sent north to replace French soldiers called away from their factories to the front. It became a nationwide phenomenon when pieds-noirs, or ethnic French born in North Africa, surged north at the end of the Algerian War in 1962 for fear of reprisals, bringing the local cuisine with them. Today there is no contesting the popularity of couscous among the French. In a recent major poll on favorite dishes, couscous came in third, after magret de canard (duck breast) and moules-frites (mussels with French fries), and ahead of such classics as blanquette de veau (veal stewed in cream), côte de boeuf (thick rib steak) and leg of lamb. Smoked herring and potatoes bathed in a gentle vinaigrette is a classic French bistro starter. 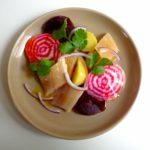 In this rendition, two types of beets are added to the plate — cooked red beets and raw, striped heirloom beets — along with onion and cilantro. 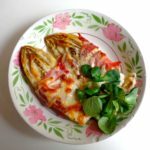 I was inspired to prepare the dish this way after encountering it last winter at one of my favorite Paris bistros, Le Desnoyez, where presentation is an art form and the food is modern and delicious. All of the ingredients for this dish can be easily found in Paris. Every fishmonger carries unpackaged smoked herring — harengs saurs — and it is also available in supermarkets, vacuum packed in plastic. Red beets are sold precooked, which simplifies preparation, and the striped chiogga heirloom beets have come into fashion in recent years and can be found at farmers markets and upscale food shops. As always, however, improvisation is the name of the game. 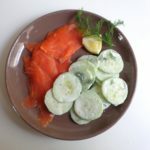 Americans could substitute smoked mackerel (preferably) or smoked salmon for the herring. If you cannot find striped beets, you could slice up some raw red beets or another heirloom variety. The aim is to create a dish that is both beautiful and tasty, paying attention to color as well as flavor. 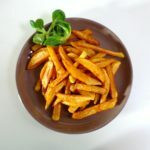 Although harengs pommes à l’huile is traditionally served as a starter in France, it also makes a lovely lunch dish. Serve it with fresh crusty bread or toast alongside, and uncork a bottle of white. At lunchtime you could follow up with cheese and fruit, while if this is your starter at dinnertime, afterwards anything goes. For example, you could create a bistro-style meal by starting with the herring, following up with boeuf bourguignon or roast chicken, and finishing with crème caramel or chocolate mousse. Once you have assembled the ingredients, preparation is quick and easy. This dish is traditionally served in winter — now’s the time. With the holidays behind us, it’s time for simpler fare. Rustic and wholesome, French white bean soup makes a fine January meal. Begin or follow with a salad, add some cheese and fruit, open a bottle of red and voilà. In this version, the soup is flavored with garlic, onion and rosemary. 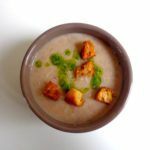 When I cooked up a pot of it on a recent gray Paris day, I topped the soup with a drizzle of herb-and-garlic infused olive oil and some freshly baked croutons. This soup is a staple of French country cooking and comes in many guises according to region. In the northern half of France, some cream might be swirled in at the end. In the southwest, the soup might be topped with chorizo chips. You can cook the beans in water or homemade broth, as you prefer, and add some bacon to the pot for a smoky flavor. You can combine pinto beans and white beans, as I did in the soup pictured above. Now for a little history. White beans, which are native to the Americas, have been popular in France since they were introduced by Catherine de Médicis of Italy after her marriage to the French king Henri II in the 16th century (so the story goes). What Anglophones know as navy beans, great northern beans or cannellini beans are often identified here by the region where they are produced: coco de Paimpol (Brittany), comtesse de Chambord (along the Loire), lingot de Castelnaudary (southwest), to name a few. This is largely academic for cooks, however, as any type of white beans can be used for making soup. Here’s wishing you all a wonderful new year. Linzertorte is one of my favorite desserts, and when better to serve it than over the holidays? This classic cake, which takes its name from the Austrian town of Linz, is now enjoyed worldwide. The nutty shortbread-style pastry is filled with jam — typically black or red currant or plum — but in Alsace, where it is often served over the Christmas season, raspberry jam is preferred. 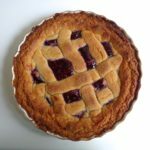 I first began making linzertorte at the Café Dewitt in Ithaca, New York, where we turned out five fancy cakes a day along with soups, salads, sandwiches, quiches and a daily special such as boeuf bourguignon. The pastry is a sweet buttery dough to which ground nuts are added. Preparation is fun — you line a tart pan with part of the dough and use the rest to form ropes and create a lattice. The cake is often served with cream on the side. There is plenty of lore about linzertorte, much of it dubious. If you search online, many recipes will tell you that this is the world’s oldest cake, with the first known recipe dating back to 1653. (Although the cake is said to hail from Linz, that early recipe was found in a document written in Verona, Italy). As it seemed unlikely that people began eating cake only four and a half centuries ago, I decided to look into the matter. As it turns out, another of my favorite desserts, cheesecake, dates back to around 2000 BC, when it was enjoyed in ancient Greece, according to archeologists. Other forms of cake are still older. Pancakes have been dated to around 3300 BC, when Otzi the Iceman consumed them for what was to be his last meal. And corn-flour tamales filled with fruit are said to have been enjoyed by the ancient peoples of Central America as far back as 5000 BC. Leaving history aside, linzertorte makes a wonderful addition to anyone’s culinary repertoire. It is fantastically delicious, and beautiful to behold. If you’re still thinking about your New Year’s Eve menu, it would make a very special dessert. Add a couple of sparklers, et voilà. Happy cooking. 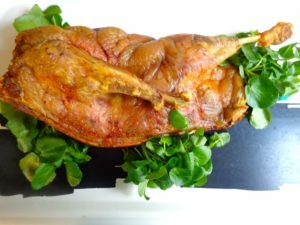 Roast goose was a traditional Christmas dish in France for many years, probably for centuries, but it is rather rare on holiday tables these days, having ceded its place to turkey, capon or duck. Nonetheless, roast goose is delicious. This year I decided to roast a goose well before Christmas in order to post it here in time for you to think about it, and perhaps make it. But getting the goose proved harder than anticipated. In fact it was a bit of a feat. It all began in early December when I invited a few friends over for dinner the following Saturday, promising them roast goose. I set out to the local farmer’s market on a Sunday morning, six days ahead of time, hoping if not to find a goose at least to order one. My favorite poultry merchant, Monsieur Breton, had no geese on display. When I asked if he could get me one when the market reconvened on Thursday, he gave me a Gallic shrug. The problem was not just that geese are raised in France to be ready for the market only in the week ahead of Christmas. There was also the matter of the gilets jaunes, the protesters demanding a living wage who have blocked roads and, joined by hooligans on Saturdays, wreaked havoc in France for the last few weeks. Monsieur Breton said that even if he could find a goose that was ready for the market, he couldn’t be sure he could get it. For the protesters have not only blocked roads, they have blockaded fuel depots, and gasoline supplies are uncertain throughout the country. Trucks aren’t delivering the goods. ‘Call me Wednesday,’ said Monsieur Breton, handing me his card. On Wednesday I called. ‘Call me Thursday,’ he said. I tried, but he didn’t answer. By this time I had called off the dinner party. In any event, a couple of guests had begged off, saying they were afraid to cross Paris on a Saturday night, what with angry people setting cars on fire and smashing windows throughout the city, and the police riposting with tear gas. But I still wanted to make the recipe for the site. So I texted him on Friday morning. Again, no reply. Early Friday evening, I was minding my own business at home when my phone signaled that I had received a text. It was Monsieur Breton. ‘You can count on a goose on Sunday morning,’ he wrote. Well! I quickly rescheduled the dinner for the following Tuesday. Four people could make it, and a fifth wasn’t sure. On Sunday morning, I took my time about getting to the market. It was raining hard, but eventually off I went. Arriving at Monsieur Breton’s stand, I peered at the poultry display. There I saw … half a goose. As Monsieur Breton was nowhere to be seen, I hailed his wife. ‘Excuse me,’ said I in dismay, ‘but where is the other half?’ Again, the Gallic shrug. ‘We sold it,’ she said. ‘But I ordered a whole goose,’ I protested. ‘Would you possibly have another?’ She looked around for her husband. He might have one, she said. At that point, Monsieur Breton arrived on the scene. Along with the half a goose, he gave me half a liver, half a gizzard and half a neck. He also proposed half a heart, but I passed. The 9-pound bird would feed four or five, he said, and should roast for 2-1/4 hours. I had my doubts about the cooking time, but had no doubt that I wanted my guests to have enough to eat. Not wishing to add another bird, I decided to make several side dishes — pear slices sautéed in butter, sautéed baby artichokes, stuffing and watercress salad — with braised fennel soup to start, and cheese and clémentines to finish. One of the guests brought a poppyseed Christmas cake she’d acquired in Berlin. No one went hungry. I roasted the goose on the Tuesday morning — I couldn’t wait until dinnertime because my recipe photos need natural light. Early preparation turned out to be a great idea. I was able to carve the goose at my leisure and reheat it just before serving. In the end, the roasting time was 1-1/2 hours, perhaps because it was only half a goose. 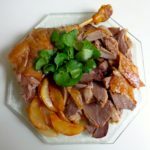 If you’ve never roasted a goose before, there are tips on the recipe page for ensuring that it stays tender and moist. In the next few days, I will update the Holiday Menus page with this recipe and others you may wish to consult for creating a festive occasion. Happy cooking, and merry Christmas!